Pneumatic Hammers feature vibro-reduced housing. Offering large D-handle and multiple gripping surfaces, chipping hammer Model TEX 05PE is developed for small jobs in soft material, while medium-weight pick hammers, Models TEX 09PE and TEX 12PE, handle medium to heavy applications in brick, concrete, or other hard materials. TEX 05PE comes with standard hexagonal 19 x 50 mm shank, while TEX 09PE and TEX 12PE come in 2 versions, one with standard 22 x 82.5 mm hexagonal shank and one with 25 x 75 mm round shank. "The hammers feature a new vibro-reduced housing, which reduces vibrations throughout the whole hammer body", explains Jan Ohlson, Product line manager, pneumatic hammers and breakers. "There are vibro-reduced handles and other gripping surfaces for the operator to use. 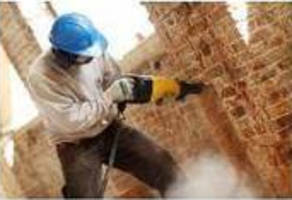 Compared to standard pneumatic hammers, the operator experiences less vibrations in both hands." The new range comprises the chipping hammer TEX 05PE, developed for small jobs in soft material, and the medium-weight pick hammers TEX 09PE and TEX 12PE, designed for medium to heavy applications in brick, concrete or other hard materials. The multiple gripping surfaces give the operator the possibility of choosing an optimum working position. All three hammers have a large D-handle with enough room for a gloved hand. TEX 09PE and TEX 12 PE are also equipped with a flexible front handle that provides excellent support. Another feature on TEX 09PE and TEX 12PE is a new latch. It gives quick tool changes in combination with low weight and easy operation. The TEX 05PE comes with a standard hexagonal 19x50 mm shank, while the TEX 09PE and TEX 12PE come in two different versions, one with the standard hexagonal shank 22 x 82.5 mm and one with a round shank 25 x 75 mm. The products and services range from compressed air and gas equipment, generators, construction and mining equipment, industrial tools and assembly systems, to related aftermarket and rental. In close cooperation with customers and business partners and with more than 136 years of experience, Atlas Copco innovates for superior productivity. Headquartered in Stockholm, Sweden, the Group´s global reach spans more than 160 markets. In 2008, Atlas Copco had 34 000 employees and revenues of BSEK 74, (BEUR 7.7). Learn more on http://www.atlascopco.com/. Atlas Copco Construction Tools is a division of the Construction and Mining Technique business area. The company is a leading supplier of hydraulic, pneumatic and petrol-driven breakers and drills and of hydraulic breakers and silent demolition tools attached to carrier units. The products are marketed under the brand name Atlas Copco. The equipment is fabricated in Sweden, Germany, India, Bulgaria, China and South Africa and sold via a woldwide operating sales and service organization.